HSP Garden Buildings Holkham Gazebo 2.4m (7'9) Dia. Hexagonal in shape, incorporating three open sides and three solid / trellised, the Holkham Gazebo might be found tucked away in a private leafy part of the garden or placed as an elegant centre piece around which the garden can be created. A Hi-eaves traditional style apex shed 1.83x1.22m available with many configuration options. 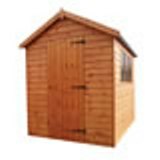 Traditional Heavy Duty Pent Shed 4.88x2.44m. This John Deere tanker features a pump and a spray gun. 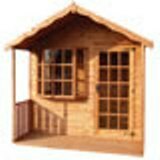 The Buckingham summerhouse 4.27 x 3.05m a large garden building with multiple uses.